Golden Spins Casino is no longer available . Click here for alternative casinos . Wondering what Golden Spins Casino is all about? We proudly introduce a unique competitor to the online casino market, boasting a ton of top-rated games , promotions and banking methods. Golden Spins Casino is another new competitor in the industry, but should be set for a good run. Having only been founded in 2015, they may lack the experience you'll find at some of its competitors but being a new company also means that each and every customer is valuable to them and should thus be better looked after. Golden Spins Online Casino does not have a larger parent company who can show them the ropes and get their feet firmly planted. This presents them with quite a challenge considering how difficult it is to make a success of a new online casino, but for now they seem to be up to the task and we hope that they will be able to endure. They have been licensed by the Curacao Gaming Authorities, one of the leading authorities on online gambling in the world. This gives them rights to trade in most countries around the world with some notable exceptions being Canada and the United Kingdom. This doesn't seem to be a problem though as their primary focus points to the United States. As such, their website is only available in English and the only supported currency is US Dollars. Most online casinos opt to employ various software developers to ensure they have a wide list of games available for their clients. Curiously though, Golden Spins games section chose to employ BetSoft as it's sole software provider. As far as providers go, BetSoft can duke it out with the best of them but it's still strange that additional companies weren't considered. Betsoft is well known for the incredible visuals used in their games. Their state-of-the-art 3D graphics coupled with the beautiful audio and addictive gameplay mechanics help make their games some of the most sought after in the industry and will have new players flooding in and old players coming back again and again. Today, they can boast a portfolio of over 150 games of the highest quality across countless themes. Their game offerings include slots, Blackjack, Roulette, Video Poker, table games, lottery games, Keno and 3D Poker. They are also proud to bring you a range of slot games that have been specifically modified to function on all model Windows, Android and iOS mobile devices. The list of mobile compatible games is expanding monthly and already include some of their most popular titles. They don't just offer great products but also put in the effort to look after their clients by providing industry leading support and service. Slots are the main attraction at Casino Golden Spins and you'll find various video slots, progressive slots and a 3D slot game as well. These offerings from BetSoft are some of the very best you'll find online and feature great gameplay mechanics, visuals, audio and bonuses. 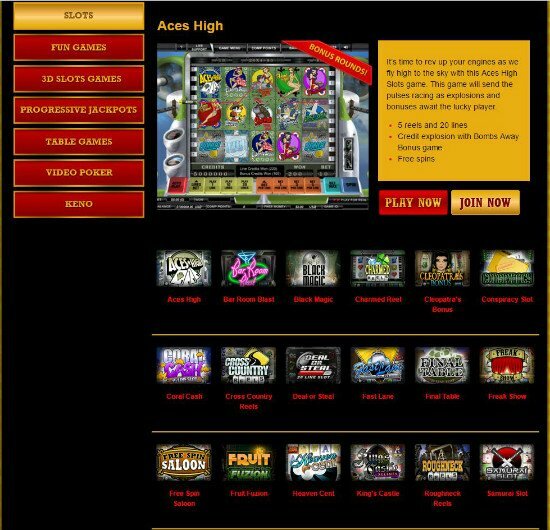 A total of 20 video slot games are available. There is also 1 of BetSoft's 3D slot games available named 2 Million BC. This game takes you back to the stone age when cavemen still ruled the world among the dinosaurs and took everything they wanted by force. Spin the reels to find the right symbols and help your character along his journey where he'll have to conquer raging flames, hunt down sabertooth tigers and collect valuable stones. Table games are always good fun and lovers of those games will find several to enjoy here. Among the list are various iterations of Roulette, Baccarat, Blackjack, Poker, Craps, Pai Gow and Red Dog. Roulette comes in both American and European forms and most of the other games will have at least 2 or 3 different options. Next we look at the Video Poker games which are limited to 4 variations but these are some of the most popular versions of this slot based card game. The video Poker games available include Deuces Wild, Double Barrel Video Poker, Jacks or Better and Wild Joker Video Poker. There may not be any Bingo games but you will find 2 varieties of Keno including Shockwave Keno. Finally, we look at what Golden Spins call "Fun Games". This is a list of interesting games, each with unique gameplay that sets them apart from each other and makes it difficult to put them in any other category other than "fun". The game varieties at Golden Spins Online Casino may not be as vast as those found at competing casinos but there are still a lot of great games to enjoy and most players shouldn't find themselves as the subject of boredom any time soon. Having so little time to prove themselves, it's difficult for us to say whether the support at Golden Spins Casino is up to standard. 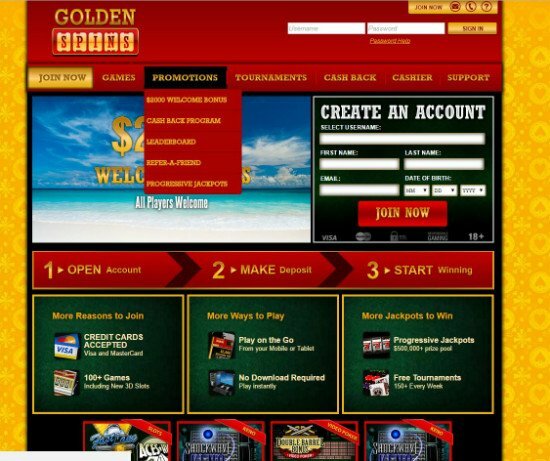 While there were a number of comments available online that reference Golden Spins Casino, most of them were positive and the negative comments mostly cited issues with the limited game offerings or misunderstandings regarding bonuses. Thus far we haven't found any complaining about subpar support which is promising. Looking at the casino itself, we found that they do offer 24/7 support. Some of the largest casinos in the industry still only offer business hour support so for a new casino to be available at all times is rather impressive. Support is done via phone and email & surprisingly lacks a live chat feature. This is odd since most players seem to prefer using live chat for their support nowadays as email support is generally too slow and phone support can be rather expensive if you are not in a region where a toll free number is offered. To cut down on support calls and emails, Golden Spins Casino have compiled a good list of answers to frequently asked questions. The list of FAQ's is divided into the following categories, Getting Started, Funding your account, Bonuses, Cash Back and Comp Points, Golden Spins Casino Tournaments, Technical Issues and Account Security. The information provided here seems to be fairly comprehensive and well written. Furthermore, in service of their customers Golden Spins Casino has put a lot of effort into making the experience with them as safe and secure as possible. As such, they've implemented SSL encryption to protect their client data as well as data sent to and from payment processors. This is the same tools used by most reputable online banks and merchants. To ensure their games are fair and unpredictable, all games developed by BetSoft are audited by Gaming Labs International. They've gained a certificate for this which can be viewed at the BetSoft website. As can be expected from an online casino, there are some great special promotions available to both new and existing players. Good games work well in keeping clients happy but if they feel appreciated then they should play even more. Below is an outline of the various promotions currently on offer, note that these may change at any point. All new casinos put their focus on drawing new players since they can't make any money if they don't have a client base. This is why welcome bonuses are offered and the one at Golden Spins Casino is one of the better ones out there. To qualify for this bonus, players simply need to register for an account and make a deposit. The first deposit amount will give you a 100% deposit bonus up to £500. This means that if you deposit the maximum amount of £500, you'll receive an additional £500 as your starting capital. In addition, players may also enjoy a similar bonus among their next 3 deposits. While these deposits also grant you a maximum of £500, the bonus percentage is only 50%, so you'll need to deposit £1000 for each instance to claim the maximum welcome bonus of £2000. As is expected, they do have a wagering requirement that needs to be satisfied before any withdrawals may be requested. This amount varies depending on where you spend your time. Playing video slots and Keno offers the lowest wagering requirement of 25x. This amount is increased to 30x for 3D slots and 40x for most other games, however the majority of table games requires 80x wagering to qualify for withdrawals. It would be wise then to avoid the table games for the first while until those requirements have been met. For a limited time only, all additional deposits made by existing players who've already receive their welcome bonuses, will receive a further 100% deposit bonus up to £1,000. Hurry as this offer only lasts for a certain time after which the regular reload bonus will return. The regular reload bonus is not as impressive but still helpful and will provide players with a 10% bonus up to £250. 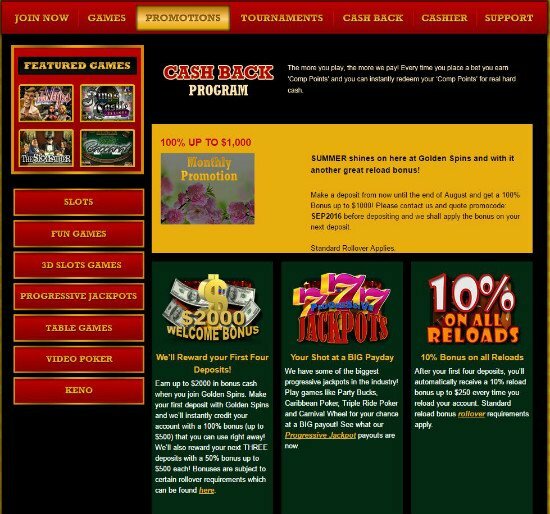 The cashback program at goldenspins.eu is what most casinos would call their loyalty program. This is where players earn loyalty points, in this case named comp points, which can later be exchanged for cash. Additional comp points may be earned once players qualify for the VIP program which we'll get to in just a moment. Big Payday refers to the jackpots available at Golden Spins progressive jackpots section which have some of the biggest anywhere in the world. Spend your time playing Party Bucks, Caribbean Poker, Triple Ride Poker and Carnival Wheel and you could be the next lucky winner of one of these life changing, progressive jackpots. 3 separate leaderboards are present, giving you 3 times the chance to win. These show the highest winning players in Blackjack, Slots and Video Poker. Compete to be the top dog in one of these categories and you could end up winning your share of £400. Golden Spins Casino regularly offers access to tournaments across various games which could be free to enter or cost a small buy-in. Winning such a tournament will not only bring you pride and prestige but also some hefty winnings. The Golden Spins VIP club is not available to the public but instead top player accounts are monitored and once a player qualifies for this program, they'll receive an invitation to join. This ensures the exclusivity of the program and helps the VIP members to really feel like VIP's. VIP players will enjoy a whole range of benefits which include additional comp point earnings, VIP exclusive bonuses and special promotions as well as invitations to great events. If you're happy with the experience at Golden Spins Casino then why not get your friends and family to join you in the fun. If you do then you may be rewarded as well. Instead of offering a single lowly amount for a referral, Golden Spins Casino are willing to offer you up to £250 for each referral you send. This is based on a 100% bonus from the first deposit made by the person you referred. Golden Spins Casino is still new and might still be finding their feet but we can't help but feel that the payment methods on offer are rather limited. The only methods available for deposits are Mastercard, Visa and Quick Cash and withdrawals have the added options of Swift Check and bank transfer. None of the popular payment gateways like Neteller, Skrill or Paypal are included and this may be seen as a huge black mark that may deter players from joining. Once a withdrawal request is made there will be a 24-48 hour period during which the withdrawal goes through approval. If approved there will be an additional waiting period of 5-10 working days for card payments, 3-4 working days for bank transfers and 8-10 working days for cheque payments. Casino Payment gateways are usually preferred not just for their convenience of managing your funds from a single place but also because processing times tend to be quicker than with other methods. Golden Spins Casino Payments will need to be improved in that matter. The theme utilized by Golden Spins Casino seem to be reminiscent of an old Western Saloon. The font is that used in towns in the Wild West and the yellow background with the various card symbols seem like old raggedy wallpaper. The rest of the site is mostly darkish red, black and green with text in the same faded yellow as the background. While we can appreciate what they tried to do here, the execution just doesn't work for us. Additionally, there were several times where graphics on the site appeared fuzzy, as if the quality of those images was really low. The result is a site that tries to be something while not fully committing and ends up feeling like an amateur's attempt at building a professional site. The layout on the other hand works rather well. The top of the page contains the Golden Spins logo with the option to sign into your account. There is also a quick support bar right at the top with links to email and phone support as well as the FAQ section. Below this bar you'll find the navigation pane with links to the promotions, games, tournaments and a few other areas on the site. The middle of the site feels mostly uncluttered which is a relief as it's very easy for a site like this to overwhelm you with information. Everything is nicely divided into large tiles to separate each bit and make it stand out nicely. The games page is equally user friendly, with a sorting bar on the left to move between slots, 3D slots, fun games, table games, video Poker and Keno. Selecting a game on any page brings up a small preview with some basic information on the game, it's theme and mechanics. While a free play option isn't available, this quick preview should give players a good idea of what to expect with each game. Golden Spins Casino has only had a year to find their feet so we never expected them to be perfect. While they do have some good offerings, there are also various areas that could do with some improvements. The games on offer are good but lack variety and that seems to be the theme with most areas here. Luckily though, everything they do offer has been done well. It is a pity about that web design though because it gives off a less professional feel than we've come to expect from online casinos. The big plus point however is the range of bonus offers available to all players. New and existing players should have a lot to look forward to here. In conclusion then, there's a lot to like about Golden Spins Casino. They are definitely heading in a positive direction but could use a little more variety in general.